The most striking feature of Wutong, the preeminent God of Wealth in late imperial China, was the deity’s diabolical character. Wutong was perceived not as a heroic figure or paragon but rather as an embodiment of greed and lust, a maleficent demon who preyed on the weak and vulnerable. In The Sinister Way, Richard von Glahn examines the emergence and evolution of the Wutong cult within the larger framework of the historical development of Chinese popular or vernacular religion—as opposed to institutional religions such as Buddhism or Daoism. Von Glahn’s study, spanning three millennia, gives due recognition to the morally ambivalent and demonic aspects of divine power within the common Chinese religious culture. Surveying Chinese religion from 1000 BCE to the beginning of the twentieth century, The Sinister Way views the Wutong cult as by no means an aberration. In Von Glahn’s work we see how, from earliest times, the Chinese imagined an enchanted world populated by fiendish fairies and goblins, ancient stones and trees that spring suddenly to life, ghosts of the unshriven dead, and the blood-eating spirits of the mountains and forests. From earliest times, too, we find in Chinese religious culture an abiding tension between two fundamental orientations: on one hand, belief in the power of sacrifice and exorcism to win blessings and avert calamity through direct appeal to a multitude of gods; on the other, faith in an all-encompassing moral equilibrium inhering in the cosmos. Richard von Glahn is Professor of History at the University of California, Los Angeles. He is the coeditor of The Song-Yuan-Ming Transition in Chinese History (2003) and The Country of Streams and Grottoes: Expansion, Settlement, and the Civilizing of the Sichuan Frontier in Song Times (1987). "A classic. 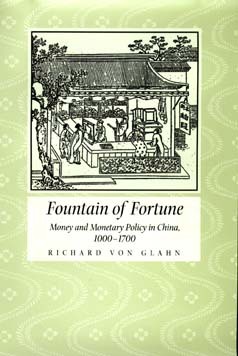 All subsequent work in areas related to Chinese monetary history will simply have to follow in von Glahn's footsteps. "—Dennis O. Flynn, author of Born with a "Silver Spoon"